West Columbia will be home to brand-new, luxury housing by the fall 2015. The townhomes will have a modern feel inside and out. The townhomes are touted to have a modern feel inside and out. The latest project by FOS Development, FLOW Townhomes, will sit adjacent to Bridgepointe condominiums, just over the Gervais Street bridge on Sunset Boulevard. FOS Development co-owner Wade Caughman said a total of 24 townhomes will be constructed starting in early January. Individual features of the three-story townhomes include a private garage, open-concept living space and outdoor greenspace. Amenities including a resort-style pool, a bocce ball court, modern landscaping and gated security that will be available to the entire community. Homeowners can choose from add-ons like a private elevator, built-in coffeemaker and multiple color options for their kitchen range. Two floor plans range from 2,100 square feet to 2,800 square feet with either river or city views. Prices will range from $360,000 to $370,000 and $460,000 to $480,000 with riverfront homes on the higher end. Caughman said nine homes already have been sold from the first phase of 12 properties. FOS Development also plans to use local contractors. Caughman said the location is ideal for people wanting to live near Columbia with a view of the city. “There’s not much land like this left,” he said. 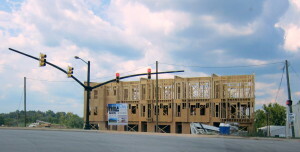 Other properties developed by FOS include City Club in the Vista and Parrish Plantation in Springdale.